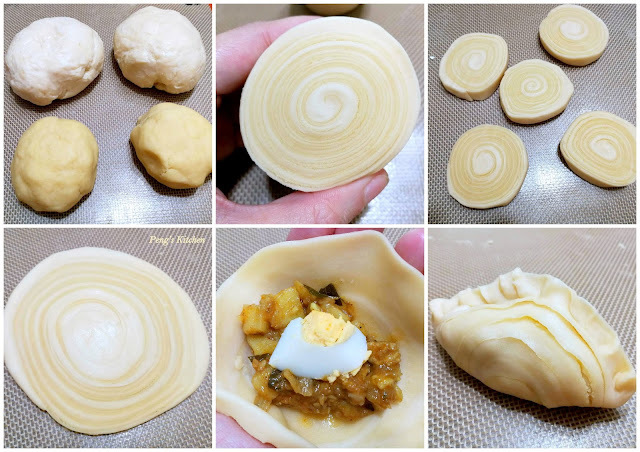 This is my second attempt on making spiral curry puff and this time round the spiral is so much prettier and obvious! 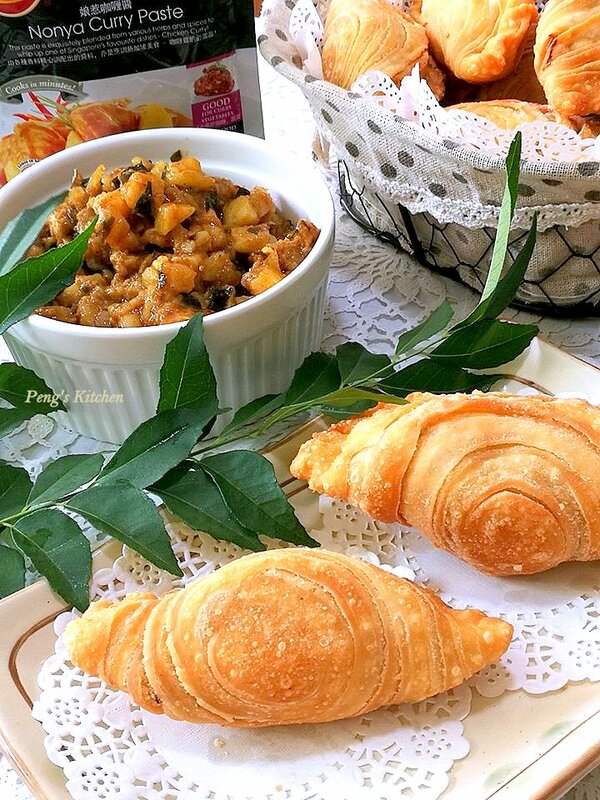 It is rather challenging to make this spiral curry puff. I actually teared a couple of the dough while rolling out! *sweat* But the end result is so rewarding after seeing the golden brown spiral curry puff! 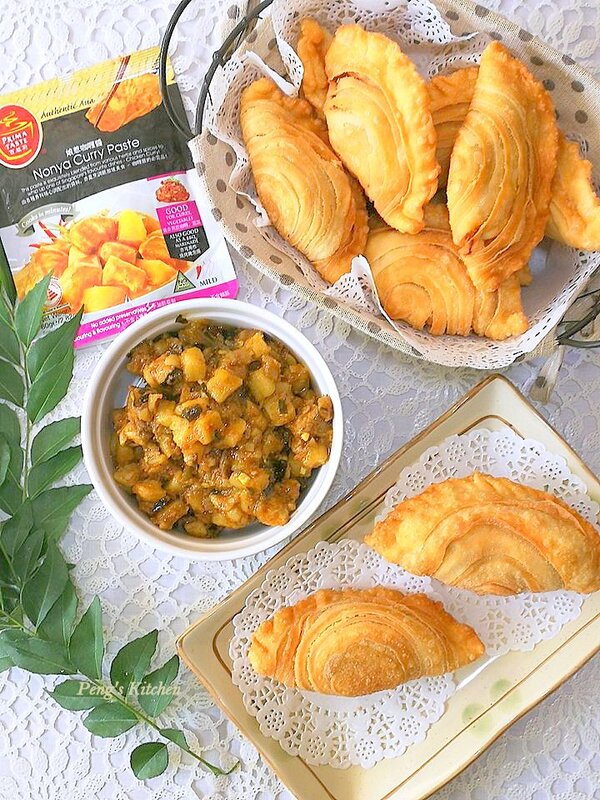 Luckily the curry chicken potato filling is easy peasy to prepare with the use of Prima Taste Nonya curry paste! I only marinated the diced chicken meat with some meat curry powder for more intense flavour. 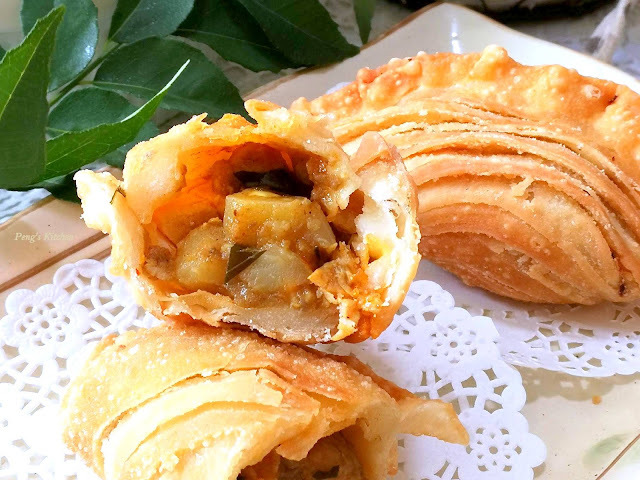 The filling is really yummy and fragrant. I've prepared more filling so there's some extra after using it for wrapping. Hmmm....maybe I can make use of the balance to make some bread rolls! Marinate chicken breast cubes with curry powder and salt for at least 30 mins. Heat 1 tbsp oil in wok. Add onion and garlic and saute till fragrant and onion caramelised. Add in marinated chicken meat and fry for 1 min. Add in Nonya curry paste and mix well for 1 min. Add in hot water and bring to a boil. Add in potato cubes and mix well. Lower heat and simmer for 25 mins until the water has almost evaporated. Stir the mixture in between simmering time to prevent scorching at the bottom. Add in sugar to taste. 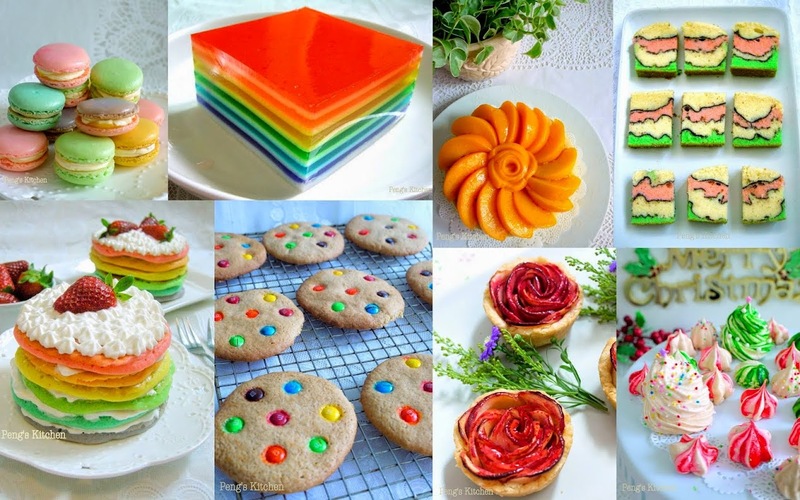 Mixture should not be too dry or wet. 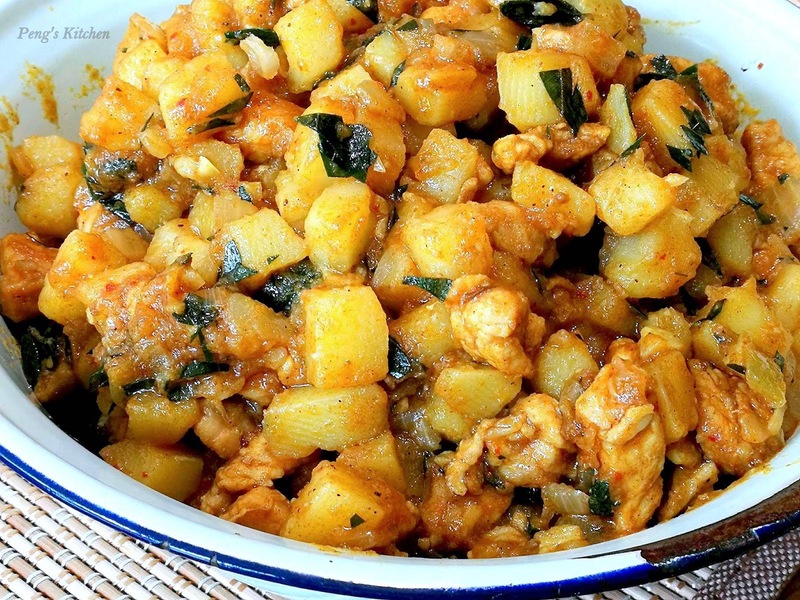 Stir in chopped curry leaves. Remove the mixture from wok and cool down completely before using. Combine water dough and oil dough respectively into a soft pliable dough. Divide each dough into 2 equal portions. Cover and rest the dough for 30mins. Wrap a portion of the oil dough into water dough. Seal the edge and shape into a round ball. Flatten the dough and roll out into a thin oval, then roll up tightly from one end to the other like a swiss roll. Turn the tube 90 deg. Repeat the step by flatten it and roll out thinly into a long oval. Roll up like a swiss roll again. Repeat steps with the other portion of water dough and oil dough. You should get 2 thick logs at the end. Cut each log into 10 equal portions*. Total you will get 20 round discs. Cover the disc with damp cloth to prevent from drying out. Flatten each disc into a thin circle without the layers splitting apart. Fill curry chicken potato in the middle and seal the edge firmly. Crimp the edge to form patterns. Heat some oil in a medium saucepan. Deep fry the puffs until golden brown. Remove and drain well on kitchen paper before serving. 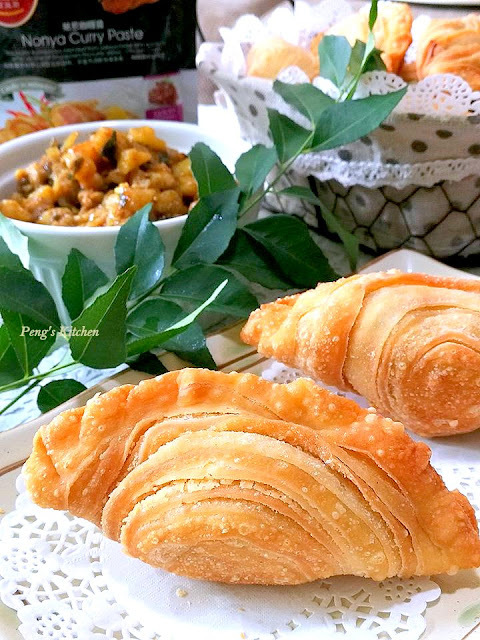 * Cut into 8 portions if you prefer larger size curry puff.